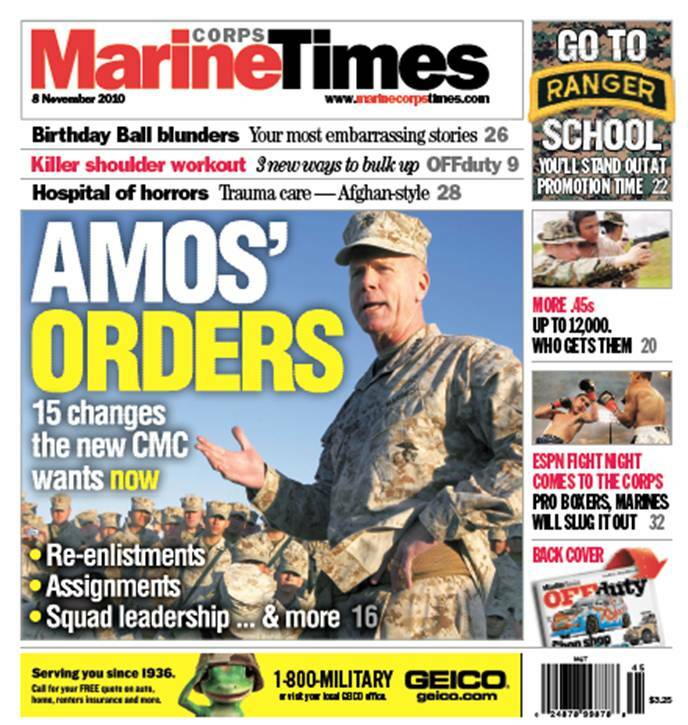 In this week’s print edition, details of what the first aviator to head the Corps, Gen. Jim Amos, has in store for you and the Marine Corps over the next four years. There’s a lot of attention paid to the big stuff like equipment, training and fossil fuel, but we’ve pulled out the information that matters most to the individual Marine and it’s clear that Amos wants to make sure Marines and their families are taken care of. His TOP priority, without a doubt, is to make sure everyone’s got what they need for the fight in Afghanistan. Related to that is his understanding that deploying units need to be in synch with their key leaders so he wants to manage how people and when people are assigned so units don’t deploy with a commander they’ve never met or trained with. And there’s tons more where that came from, as explained briefly in a Web story we posted early last week.